During Chanuka the lighting of candles is a fundamental aspect of the festival of light and it is important to remember to celebrate safely. A single candle can burn at 1000 degrees centigrade and each year 1,900 accidental fires are started in the home by candles. The devastating effects of a fire are often permanent causing terrible emotional distress to children and families. The loss of a home and the associated financial impact can be severe, and are just two of the more difficult aspects from which to recover. Most fires grow rapidly if left unchecked and can destroy everything throughout a home in minutes. Remember, it is much easier to prevent a fire from starting than it is to put it out once it has taken hold. Everyone should learn and follow the safety advice available to help keep their families and homes safe from fire. Remember it’s your responsibility, have a happy Chanuka and celebrate safely at all times. 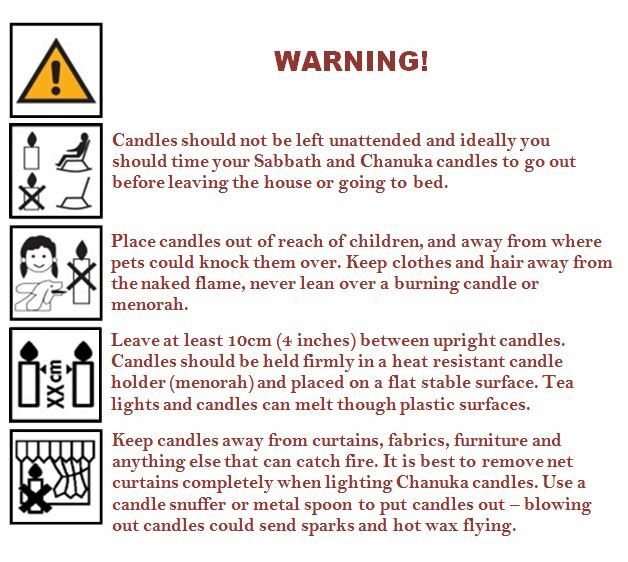 ​Keep your family safe and reduce the risk of fire in your home on Sabbath and during Chanuka by following these simple steps. Remember a candles naked flame can be dangerous and can cause fires. Don’t let a candle put your family at risk. London Fire Brigade wishes you a safe and happy Chanuka. ﻿﻿Have a look at the London Fire Brigade online safety advise which provides information and fire safety advice for at home, at work and in the community.